HIAWASSEE, Ga. – On Thursday, Jan. 18, 2018, a Hiawassee police officer attempted to make a traffic stop of a 2009 white Ford F-150 within the city limits. The driver of the pickup refused to stop, proceeding on Highway 76 west. 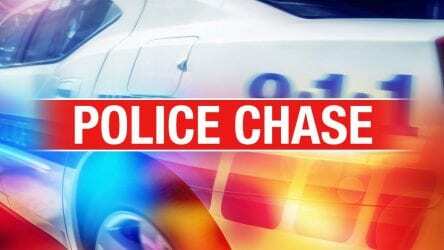 The pickup turned onto Cedar Cliff Road when the two occupants jumped out and fled from the vehicle, which had been stolen out of Nashville, Tennessee. Towns County Sheriff’s deputies responded and apprehended the fleeing suspects after two deputies located the suspects near the area where the pickup was abandoned. The female suspect, Monica Pez Benitez, was arrested without incident. The male suspect, John James Shillibeer, fled from deputies and was apprehended after attempting to hide in the crawl space under a nearby residence. John James Shillibeer, 29, of Armuchee, Georgia, was arrested and charged with one felony count of theft by receiving stolen property, one count of violation of Georgia’s Controlled Substance Act (VGCSA) for possession of amphetamine, one count of VGCSA possession of marijuana, one count possession of drug related objects, one count of driving with a suspended license, one count of reckless driving, one count of fleeing and attempting to elude law enforcement, one count of failure to maintain lane, one count of obstruction of a law enforcement officer, and one count of criminal trespass. Monica Pez Benitez, 29, of Adkins, Texas, was arrested and charged with one felony count of theft by receiving stolen property, and one count of making false statements to a law enforcement officer. In addition, John James Shillibeer is being held for Cook County Sheriff’s Office in reference to a probation warrant. Due to the teamwork and cooperation between the Hiawassee Police Department, Towns County Sheriff’s Office, Towns County Fire Department personnel, and a ranger from the Department of Natural Resources, the suspects were apprehended and taken into custody in short order. Fetch Your News is a hyper local news outlet that attracts more than 300,000 page views and 3.5 million impressions per month in Dawson, Lumpkin, White, Fannin, Gilmer, Pickens, Union, Towns, and Murray counties, as well as Cherokee County in N.C. – FYNTV attracts approximately 15,000 viewers per week and reaches between 15,000 to 60,000 per week on our Facebook page.